Investing in your education is one of the best decisions you can make. A better education can lead to a better job. In turn, that leads to higher earnings, which can eventually lead to growing your wealth with a financial advisor. But depending on where you live you may not get as much of a chance to educate yourself. Some states and their residents invest more in local education from funding high-quality middle and high schools to paying teachers competitive wages. Below we look a number of factors to determine the states that are investing the most in education. In total, we compare all 50 states and Washington, D.C. across six factors, including number of 529 accounts per under 20 residents, average investment in 529 accounts relative to household income, average spending per student, housing costs as a percent of household income, percent of residents 17 or under who are enrolled in school and the percent of 18- to 24-year-olds enrolled in college. Northeast invests the most – Seven of the top 10 states that are investing the most in their future are in the Northeast. In fact, all the top 5 states are in the Northeast. In general, states here tend to spend the most on pupils and have the highest rates of student enrollment. Western states fall behind – The worst ranking states are Arizona, Idaho and Hawaii. In each of these states, pay for teachers is low relative to the local cost of living. And local residents are some of the least likely to invest in 529 plans. The Ocean State takes the top spot. Rhode Island has the largest share of college-aged residents enrolled in college. While college is becoming more and more expensive, and students are piling on more and more student debt, college is still a profitable investment for those who graduate. In total, about 54% of Rhode Island residents between the ages of 18 and 24 attend college. 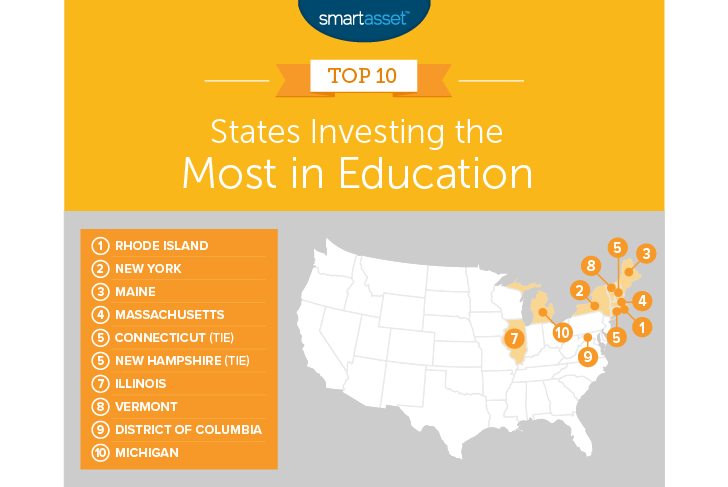 Other high scoring metrics for this state include the investment Rhode Island makes in schools. On average, the state spends about $15,500 per student in its school system. Another Northeast city takes second: New York. This state invests more than any other in local students. Census Bureau data shows that, on average, New York spends about $22,400 per student per year. Perhaps related to that funding, New York also ranks highly in student enrollment. More than 92% of residents between the ages of 3 and 17 are in school. In that metric, New York ranks sixth. Many of those students also go onto college after finishing high school. Just under 49% of college-aged students are enrolled in higher education. Coming in third is Maine. Residents here, parents specifically, do a great job of saving for and investing in their children’s educations. Our data on 529 plans shows that Maine residents set up 529 plans more often and invest more in 529 plans than almost every other state. In those two metrics, Maine ranks fourth and third, respectively. While those are Maine’s standout scores, Maine does not score in the bottom half in any metric, contributing to its top-three finish. Massachusetts, famed for institutions of higher learning, comes in fourth. Residents here are encouraged to go to college. Overall, just under 53% of college aged residents are investing in themselves by enrolling in college. In that metric, the Bay State ranks second. One potential reason why so many students go onto college is the large number of residents who stay in school. Just under 93% of all residents aged 3 to 17 are enrolled in school. Connecticut does a great job of investing in education for its youngest residents. Our data shows that, on average, Connecticut spends about $19,000 per year per student. That comes out to the third highest average in our study. One possible knock-on effect of that increased funding is that kids here stay in school. More than 94% of residents between the ages of 3 and 17 are in school, a score no other state beats. Many students also choose to invest in themselves and higher education. About 1 in every 2 college-aged residents is enrolled in college. New Hampshire 529 accounts are opened at a rate faster than any other state’s 529 plans. That is good evidence that New Hampshire residents are investing in their future. Other reasons why New Hampshire ranks in the top 10 are the high school and college enrollment figures, which are both well above average. New Hampshire could possibly look to pay their education staff more, however. According to our data, the median home costs 37% of income for the average teacher the worst score in our top 10. This state combines high student enrollment with large average investment in the Illinois 529 college savings plan to take the seventh spot. In both of those metrics, Illinois ranks in the top 10. Illinois also has top-20 scores in average spending per student and percent of college-aged residents enrolled in school. If Illinois supported its teachers with higher salaries, the state could improve its overall ranking in this study. Illinois ranks 32nd in teacher’s income as a percent of local housing costs. Vermont, with three top-five scores, comes in eighth. The Granite States strongest scores came in spending per pupil and student enrollment. In each metric, this state takes a top- 10 spot. But that is not all. Vermont also ranked sixth for college enrollment. The Census Bureau estimates that just over 48% of residents between the ages of 18 and 24 are enrolled in college. The nation’s capital is another spot investing in its future. Adolescents of all ages are enrolled in school here. In total, just under 94% of residents aged 3 to 17 are in school. That is the second-highest rate in our study. Students here are also well-funded. The District of Columbia spends about $19,200 per year per student, also the second-highest rate. Many of those students then go on to college. Just under 45% of college-aged residents are enrolled in an institution of higher learning. Last but not least is Michigan. This state-maintained consistency across the board to secure its place in the top 10. Michigan didn’t in the top 10 for any metric but also ranked above average in all of them. The state score highest in enrollment. About 91% of residents aged between 3 and 17 attend school. Many students also go on to college thanks in part to the state’s excellent universities. In each of those metrics, Michigan ranked in the top 15. 529 accounts per resident under age 20. This is the number of open 529 accounts in each state divided by the number of residents under the age of 20. Data on 529 plans comes from the College Savings Plan Network and is for 2017. The number of under-20 residents comes from the Census Bureau 2016 1-year American Community Survey. Average 529 account value relative to income. This is the average value of 529 plans divided by the median household income in each state. Data on the average value of 529 plans comes from the College Savings Plan Network and is for 2017. Median household income comes from the Census Bureau 2016 1-year American Community Survey. Spending per student. Data comes from the Census Bureau’s 2016 primary-secondary public education finance report. Housing costs as a percent of teacher’s income. This is median housing costs divided by median income for education, training and library occupations. Data comes from the Census Bureau’s 2016 1-year American Community Survey. Student enrollment. This is the percent of residents aged 3 to 17 who are enrolled in school. Data comes from the Census Bureau’s 2016 1-year American Community Survey. College enrollment. This is the percent of residents between the ages of 18 and 24 who are enrolled in college. Data comes from the Census Bureau’s 2016 1-year American Community Survey. To create our final score, we first ranked each state in each metric. We then found each state’s average ranking, giving equal weight to each metric. We assigned a score based on this average rank. The state with the best average rank received a 100 the state with the worst average rank received a 0. Start early – An early investment is usually the best investment. Using the powers of compound interest, you can find that making even modest investments at a young age can grow to become useful sums for your retirement or mortgage down payment in the future. For example, investing $2,000 at age 25 with average returns of 6% is equivalent to an investment of $6,400 at age 45. The lesson here is that even if you do not have a ton to invest at a young age, it is still worthwhile to do so. Don’t try to beat the market – While it may be tempting to try and beat the market by timing its ups and downs, it is probably not worthwhile to attempt to do so. On top of all the fees you may incur by buying and selling your securities, you also run a very high chance of not beating the market at all and losing some of your investment. Get an expert’s opinion – On the theme of beating the market, if you really want to maximize your returns, why not get the best advice? A financial advisor can not only help you secure the best returns on your investments, he or she can also help you manage those investments so they are ready for when you retire. If you are not sure where to find a financial advisor check out SmartAsset’s financial advisor matching tool. It will match you with up to three local financial advisors who fit your specific investment needs.